LinearResponseG™ full range, high-output invisible speakers incorporate patented Stealth technology to provide category-leading sound quality and extended bass response, all while eliminating the unsightly grilles and bulky boxes of traditional speakers. The award-winning line of Made In America totally invisible speakers and subwoofers, utilize injection molded frames, low profile high-power cone woofers, Neodymium tweeters and multi-stage crossover networks to deliver unmatched warmth, realism and depth of sound. From foreground music systems to home theaters; board rooms to conference rooms and masking systems, Stealth provides you with the most capable and best sounding family of totally invisible architectural speakers available in the world. The Stealth Acoustics model LR4G is a two panel, in-wall or in ceiling speaker that becomes completely invisible after installation. 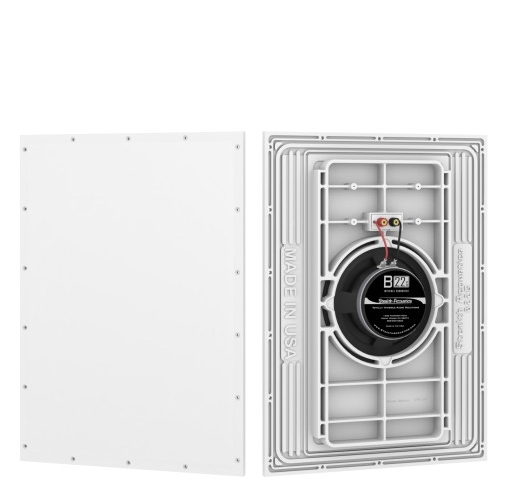 The paintable active diaphragm face is bonded to the frame of the speaker panel, creating an active area surrounded by a stable mounting perimeter. This model utilizes a separate panel for the low frequency driver to maximize clarity and reduce intermodulation distortion. The LR4G incorporates four direct-to-fiber neodymium midrange motors and one direct-to-fiber neodymium high-frequency motor aligned in the new Stealth Quad-Balanced Midrange Drive configuration. Advanced internal carbon fiber materials allow for smooth frequency extension to 20 kHz. When the LR4G is installed in standard insulated 2″ x 4″ framing and allowed to function in a full 8 foot stud bay, frequence response below 45 Hz can be achieved with the separate low frequency panel. The LR4G contains three independant protection circuits (low, mid-range and high frequency sections) that automatically reset upon reduction of excessive amplifier power. The Stealth Acoustics LR3G incorporates an acoustically coupled high-power 8” cone woofer with 3 directly coupled 25 mm neo-magnet high-frequency motors. Advanced internal carbon fiber materials allow for smooth frequency extension to 20 kHz. When the LR3G is installed in standard insulated 2” x 4” framing and allowed to function in a full 8 foot stud bay, frequency response below 45 Hz can be achieved. The LR3G contains three independent protection circuits (low, mid-range and high frequency sections) that automatically reset upon reduction of excessive amplifier power. Stealth Acoustics recommends the companion Model SA2555 250-watt subwoofer amplifier/crossover as a matched amplifier for the B22G subwoofer speakers. Stealth Acoustics also offers a line of full-range speaker panels that when combined with the B22G, deliver a complete, totally invisible audio solution.